I was in a Facebook group of entrepreneurs the other day and saw this question: "Can you be a business coach if you've never owned your own business?" 98% of the answers were: "Absolutely not!" And they came from a lot of coaches in the group. I was a little shocked. Of course you can be a business coach without ever having owned your own business. Why was the majority in this group saying the contrary? That's when I finally made the link as to why there seems to be an inflation of coaches these days; many of the coaches out there are not coaches per se, although they may call themselves that way. Although professional coaching has been around for almost 20 years, it is still a fairly new concept that not many people are familiar with. A coach is not meant to give expert advice on a particular subject. A coach's job is to drive results through proven coaching techniques and to empower and guide clients in finding their own solutions, on the basis that everyone is different and there is no single right formula that works for everyone all the time. Didn't all coaches learn this when they got certified? Not everyone who's called a coach is certified, and the coaching term has been misused and no longer holds its real meaning in people's minds. Does this mean that non-certified coaches don't help their clients? Of course not. They're most likely helpful people (trainers, mentors, consultants, therapists) who may call themselves coaches because they can relate to the term, but assist their clients through diverse means, some of which may intersect with professional coaching, and others may not. While coaching, training, mentoring, consulting, therapy, etc. are all highly supportive services that bring positive results, it's important to define them and to use each term correctly in order for clients to know the exact service that they're getting. Isn't Coaching Similar to Psychotherapy? Both coaches and psychotherapists ask their clients questions, listen, and interpret their answers, which later helps clients achieve happiness and success in their lives. So what's different between the two? *Therapy's main focus is to deal with the past. *Coaching's main focus in to enhance the future. You can see a psychotherapist similar to a physiotherapist who helps athletes get over wounds from the past, and the professional coach like a sports coach who helps athletes perform in the future. Contact a coach whenever you realize that you're standing in your way of success in an area/ multiple areas in your life (we all do, more often than we realize), and you're ready to get yourself out of the way and moving towards your goals, on your own terms. Let's be realistic, there are times when we all feel stuck: we deal with complicated issues and the solutions just won't come to surface, or we used all our resources and still feel trapped, or we know what we should be doing but just can't get ourselves to do it or to organize our thoughts in an actionable way. These are common topics that coaches work with, enhancing your self-awareness and facilitating you to find the right solutions that work best for you. For more FAQs about coaching, the International Coach Federation has some helpful answers. If you were slightly confused about coaching, I hope you're now in a better position to understand the different personal development services out there, so that you can select the right one for you. 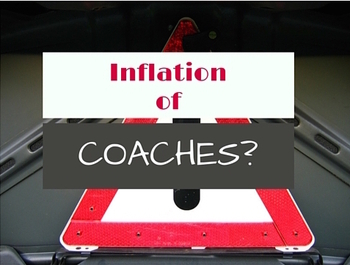 In reality, although it may seem like there is an inflation of coaches, there is probably an inflation of services that are wrongly named as "coaching". Consuela Dezso is a Career & Happiness Coach, Business Strategist, and Speaker dedicated to empowering professional women who thrive for a meaningful work-life to embrace who they are, share their individuality with the world, and attain happiness and abundance from it. She holds an MBA in Business Strategy and a Coaching Certification, but most importantly, a passion for "bringing out the best in others." Have a look at Consuela's career transformation programs here or book a complimentary strategy call to discuss how she can help you achieve career bliss. You can collect her insights on a conscious career, life & business at www.consueladezso.com and follow her on Facebook and LinkedIn @ bringing out the best in you.